Sometimes, the best races are the ones you hadn’t planned on, and basically had no specific expectations going into them. 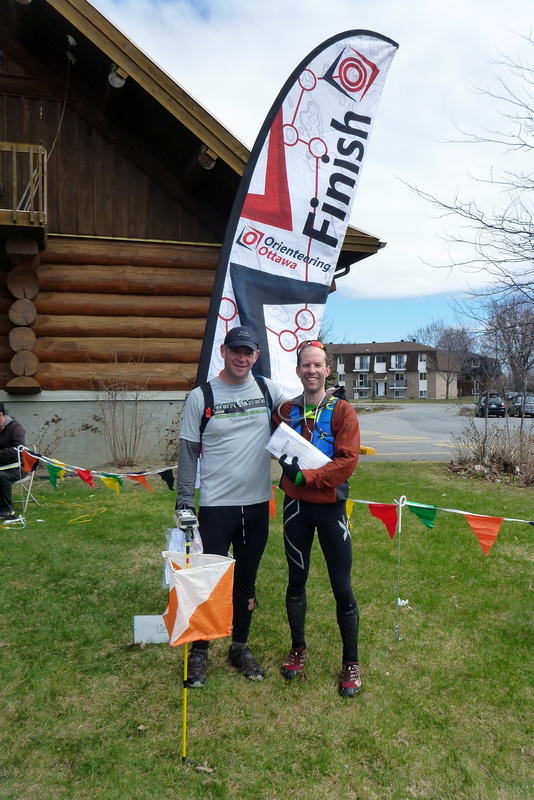 Such was the case with the recent victory my friend John Ranson and I experienced at a 3-hour orienteering race called “Challenge the Gats” happening close to home in Gatineau Park. Although we weren’t the overall winners (4 super speedy solo racers beat us), we were however 5th overall, and the 1st team to cross the line and clear the course. Read on for more on this sweet victory. 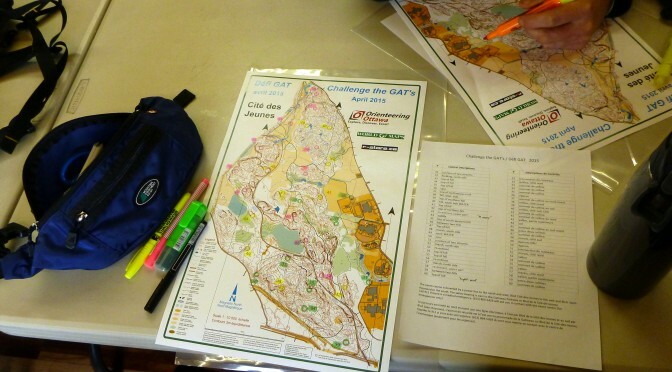 We got out maps about 45 minutes prior to the start. The weather was calm, and promised to stay dry all day, which was good news, given that we would most likely have to cross swampy areas on our journey. There was a total of about 30 checkpoints that we had to try and pick up. After scanning the map for a bit, we decided that clearing the course was definitely possible, but we set a few CPs aside closest to the finish line that we *could* skip if things went wrong out there. We opted to generally do the ‘middle’ section of the map, then do a large counter-clockwise loop to pick up the rest of the CPs, ending back in the middle section for the last few CPs before hastening to the finish line. Our race got underway promptly at 9am, with a solid collection of racers with us. There was another wave starting at 11:30am, and the total number of teams was over 110, a strong showing. In our wave were a few solid teams that had us unsure where we’d end up. What’s even more interesting about these races is that everyone will choose different routes, so passing someone on course tells you NOTHING about your standing at that point in time. Our plan was simple. Run hard, nav solidly, grab all CPs, and finish strong. John was the primary navigator, but we both had maps, so were able to consult on the fly during the race. Having 2 people that have a decent idea on how to navigate helps a LOT, as any small mistakes are quickly caught, and route choices can be confirmed. However, our speed as a team was definitely slower than the eventual winner. If you look at the final results, you’ll see what I mean. The first few CPs were picked up pretty cleanly, but we decided that I would carry the timing chip so that John could focus on the map more. That way, as we got close to a CP, I could sprint ahead to check in while he planned our next move. This worked very well, and we got into a solid rhythm out there. 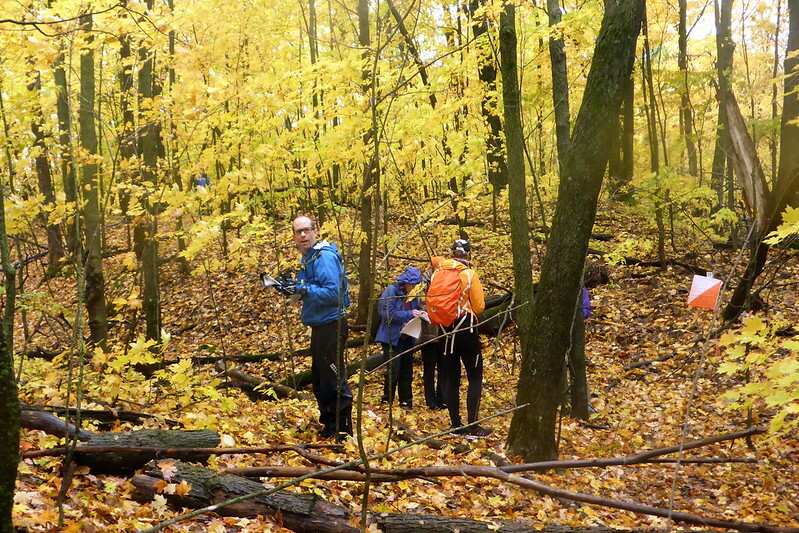 The terrain was a mix of trails and bushwhacking, with plenty of little hills to challenge us physically, as well as mentally (since you had to be very precise to ensure you didn’t top out on the wrong hill!). The only physical snafu came when I rolled my ankle coming down a steep hill and hitting a rock. I had to walk / hobble for a good 5 minutes before I could move back up to light jogging pace. Of course, this has happened so many times to me that it was no big deal to me. In the final 3rd of the course, we got a bit of a lucky break. A series of the CPs were in the snowshoe / biking trails near my old house. 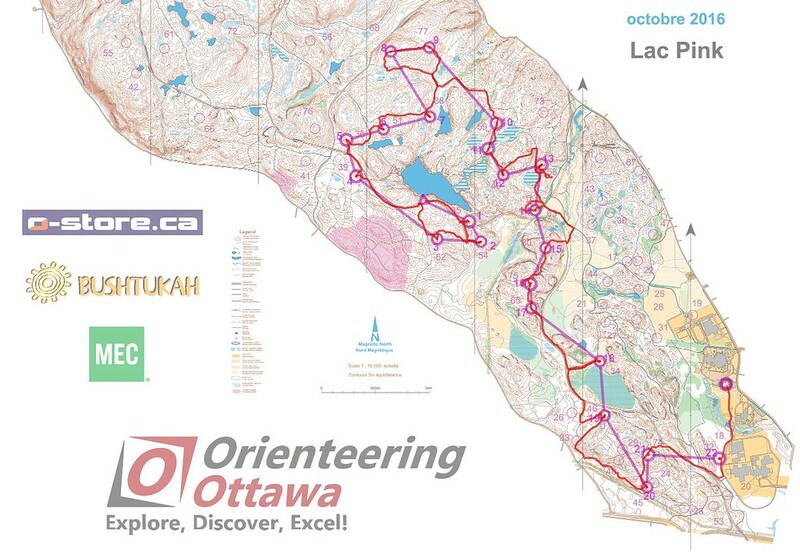 I used to do early season MTB training there, and knew a lot of the little off-shoot trails by heart, which enabled me to just glance at the map to confirm which trail to take while we were running. Grabbing these CPs in a hurry put us back in a good spot. We could see we’d clear the course with time to spare, now just wanted to see where we’d finish. We had come across another team we knew a number of times out there, but were unsure where we were compared to them. As it turned out, we were both chasing the exact same final CP! We nabbed it first, then bolted to the finish, a mere minute ahead of them!! It was then that we also realized we were officially the 1st team to finish under 3 hours and have cleared the course! Teams had come in before us, but had not gotten all the CPs. More interestingly to us, our friend Benoit Letourneau had not turned up yet. 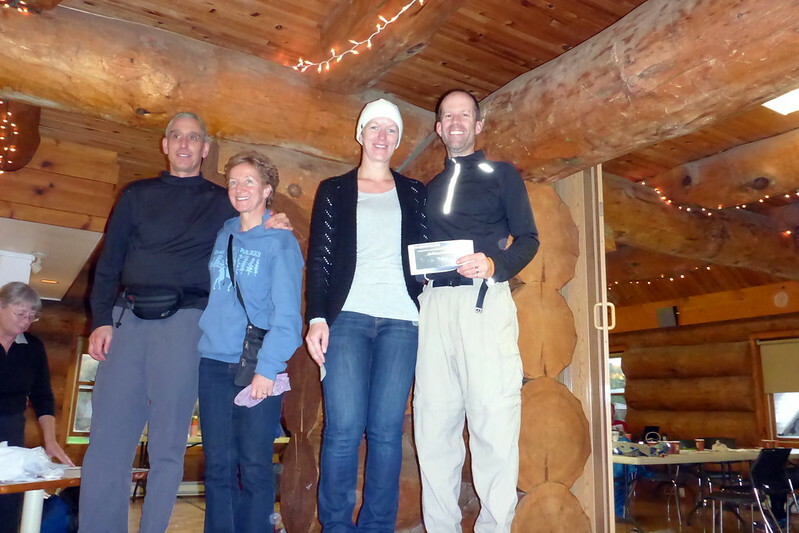 He is a master navigator, and we did NOT think we’d beat him, as his team-mate is also a fast runner. It was another 7.5 minutes before he came in. My partner John was ecstatic, saying it had taken up 15 years to FINALLY beat Benoit. Nice one! Of course, there is really no fanfare for winning these events. 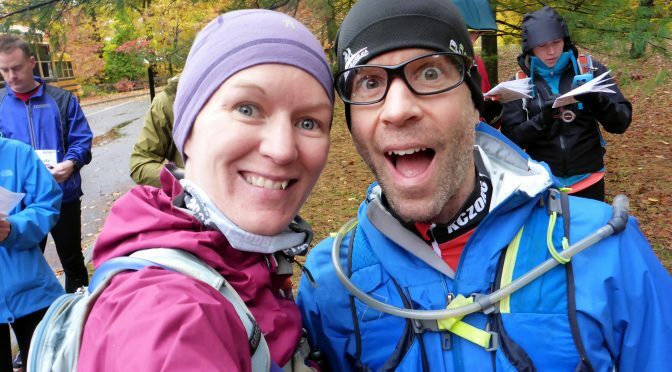 Entry fees are cheap ($20-$25), there are no t-shirts, no meal, no nothing. However, the accessibility of events such as these mean people young and old come out, and even young families. It’s a great activity for kids, as it is sort of like treasure hunting in nature! We did get super-sweet medals at the finish though, courtesy of one racers mom. She had hand-made cookie medals for EVERYONE! Now that is truly going above and beyond, and was probably the coolest post-race goodie I’ve gotten. In the end, out of 111 teams, only 11 teams managed to clear the course, so even there we were in the minority. Of those 11, only 4 were on teams, with the other 7 being solo racers. I was a little surprised at how well we did, but I suppose all that adventure racing, and careful route choices really paid off. 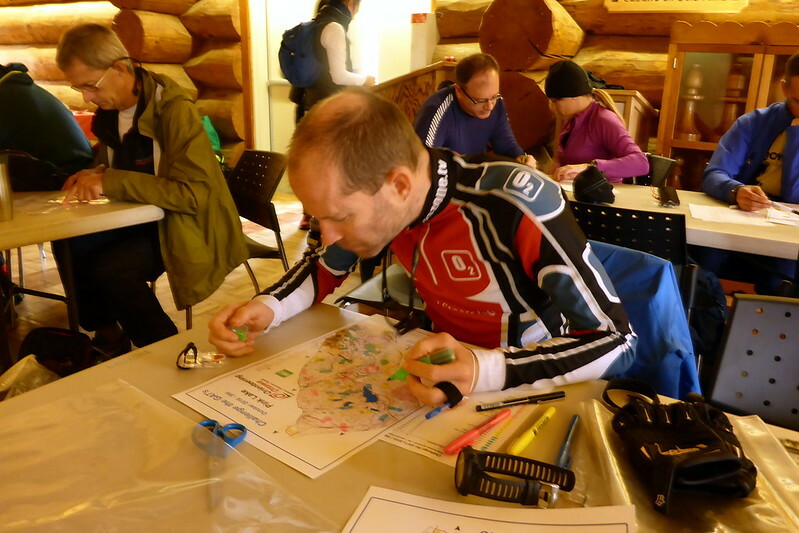 Here’s hoping I can pull off equally good navigation at my next adventure race! That will be next weekend’s Raid Pulse. Still not too late to join the fun there! Till then, stay tuned for more race reports.